EASY LAW PRACTICE MANAGEMENT SOFTWARE, TAILORED TO YOUR NEEDS. With our cloud-based platform, intuitive interface, intelligent design, and customizable features, take your law practice to Cloud 9 with the click of a button. As a bankruptcy attorney, your clients put their financial circumstances in your hands, so you need a practice management software that’ll put its money where its mouth is. With automated document generation, automated workflows, batch billing, and countless other solutions, make protecting your clients’ finances as easy as one, two, three. Comprehensive facts and optimal delivery are the cornerstones of civil litigation. Dedicate your time to delivering the best possible arguments without any energy taken up by administrative tasks. With our automated client intake forms, legal document management, and workflow generation for all of the users in your law firm, waste no time getting your facts straight. Estate planning law requires foresight. Don’t get wrapped up in the tiny clerical details of the present--let us do that for you. With our automated workflow generation, email and calendar integrations, and connectivity with thousands of your favorite legal platforms and business apps, we eliminate the distractions that get in the way of getting your clients’ affairs in order. Family lawyers comprise a huge portion of the PracticePanther family. It’s why our practice management software has all the tools necessary for running an efficient, streamlined, and profitable Family Law practice. Our customizable billing, automated legal document and workflow generation, client portal, and one-click invoicing are dispute-free (unlike some of those hearings). Your Health law firm’s well-being is important to us. 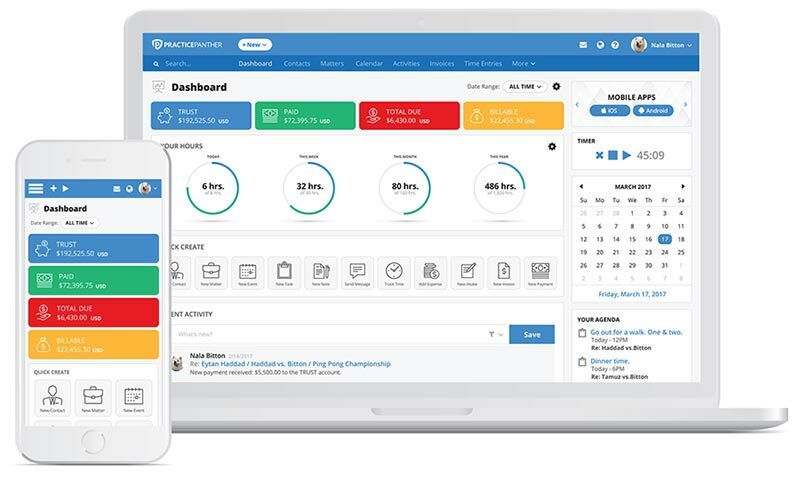 It’s why we provide the most intuitive law practice management platform to manage all communications with clients and within your law firm, invoice and bill your clients, and schedule appointments in your legal calendar– all in one place. Like immigration law, PracticePanther seeks to build bridges, not barriers, for your law practice. Your law practice management software shouldn’t stand in the way of your efficiency in advocating for your clients. With PracticePanther, save all legal documents and form filings, manage communications and invoices, and organize your calendar and court dates with the most easy-to-use software for immigration lawyers. You protect ideas. We promote your efficiency. Intellectual property attorneys benefit from our practice management software’s automated solutions, including email and legal calendar management, invoicing and billing your clients, and saving all of your important legal documents and files either online or offline. Now there’s a good idea. Labor law is hard work. Make it easier with the most intuitive law practice management software in the world. Schedule meetings with clients or opposing counsel, manage your legal documents online, and send invoices to your clients – all in one place. Managing your practice shouldn’t hurt. With PracticePanther’s law practice management software for personal injury attorneys, you can generate legal documents through automation, schedule important court appearances, and stay in touch with your clients through a secure client portal. Track your expenses and bill on contingency. It’s totally painless. Real estate attorneys shouldn’t have to live with subpar practice management software. That’s why we’re the easiest to use, most intuitive one out there. Easily draft and manage your legal documents through automation, track your billable hours and expenses, manage your law firm’s contacts and matters, and integrate with all your favorite must-have legal apps and business platforms. House your practice (see what we did there?) in a system that makes it easy. Managing your law practice shouldn’t be taxing. With PracticePanther, tax attorneys can send secure messages with clients, save legal documents online or offline, and organize your legal calendars and court dates – all in one place. Hold your law firm ACCOUNTable and stay in CHARGE with minimal effort with the highest-rated practice management software in the world. Your law practice management software shouldn’t just be “fine.” It should green-light your practice into more efficiency and productivity than ever. With PracticePanther, traffic attorneys have the automation tools at their disposal to manage all communication with clients and colleagues, invoice and bill their clients, and organize their legal calendars and court dates all in one place. Lucky for you, no speed limits here. Whatever your law practice area, we’ve got the customizable automation solutions to tailor our law practice management software to your precise needs. With an intuitive interface, easy-to-use solutions, and highly efficient performance, PracticePanther will save your law firm hours on a weekly basis, allowing you to dedicate your time and energy to the matters that matter most. We know you’re going to love PracticePanther. If you’re not 100% happy in the first 30 days, just email us for your money back.